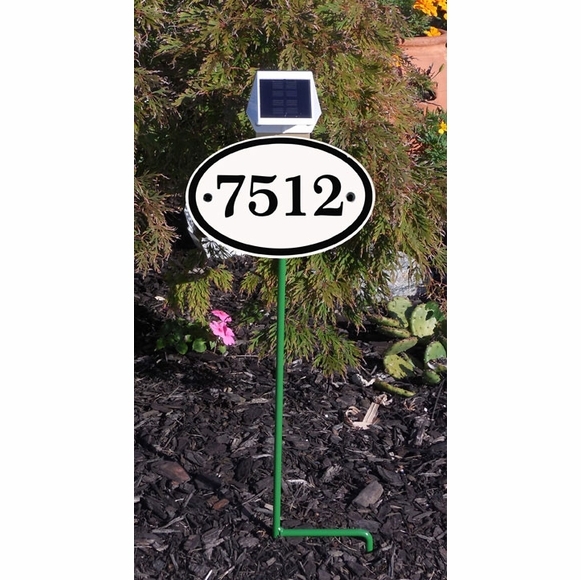 Lawn Mount House Number Sign with Solar Light - - three-piece solar sign kit consists of a personalized 9" x 6" x 1/8" oval house number sign with the solar bracket extension, solar light, and 24" black lawn stake (green stake in main photo is no longer available). Fast turnaround; ships in 1-2 days. Overall dimensions including solar light: 9"W x 9.25"H.
Includes all parts and stainless steel bolts and locknuts. Personalized oval address sign and attached solar bracket extension, solar light, and lawn stake sold together as a complete set. Had a hard time locating a sign like this so glad I finally did. I'm pleased with the product and my house can be more easily located at night. Several neighbors have already asked where they can buy one.